A helmet-a defensive covering for the head-is made of hard materials for resisting blows so as to protect ears, neck, eyes, and face. Helmets have been worn over centuries for military combat and ceremonies, later for hazardous occupations, and recently for sports. Helmet design fluctuated with changes in warfare and technology. Prehistoric peoples probably wore woven basketry or hide head protectors; ancient Ethiopians used horse skulls, manes, and tails. Archaeological evidence reveals that rawhide caps and copper helmets, protecting ears and neck nape-with chin straps and padded wool or leather lining-were worn by Sumerian, Babylonian, and Assyrian warriors during the third to first millennia B.C.E. Early Greek helmets were usually bronze hemispherical crowns. The Corinthian version incorporated a movable face mask; the Attic style had cheek guards (mentioned by Homer). Romans used Greek designs, including elaborate horsetail plumes; crested gladiator helmets were made of hammered bronze. European medieval helmets evolved from the seventh to seventeenth centuries as part of body armor, beginning with a boiled leather conical casque (spangenhelm) worn by tribal warriors over a hood of mail. During the feudal era, a large, heavy iron pot (heaume) protected the head from lances in chivalry tournaments, and the towering steel snouted visor (basinet) was worn in battle. Archers and pikemen used lighter, more flexible helmets with neck guards during the Hundred Years' War (c. 1337-1453). By 1550, the Italian-invented armet, with its thin laminated iron or steel plates and joints providing ease of movement, was adopted by many armies in Europe. The crescent-shaped morion, copied from Moorish designs, protected sixteenth-century Spanish conquistadores in the New World against Indian bows and arrows. Armor and helmet production reached its artistic zenith for knights and nobles during the sixteenth and seventeenth centuries; ornamental parade pieces often had embossed relief decorations reflecting Renaissance-style, Biblical, and mythological motifs, along with ostrich or peacock panaches. By the eighteenth and nineteenth centuries, when the ultimate weapon was a cannon, metal helmets were displaced by lighter, felt tricorne hats, lamb's fur busbys, and beaver-with-leather shakos. Another head protector came into widespread use after the 1850s mutinies in Bengal, India, where British troops encountered light, strong helmets made from the dried pith of the solah or sponge wood plant. Subsequently, the "pith sun helmet" was adopted by England and other countries for overseas military campaigns and sports. World War I technologically revolutionized warfare and weaponry. Shallow-crowned, felt-padded steel helmets protected combatants in trenches against automatic machine guns, replacing earlier spiked and plumed headgear. M-1 steel helmets of World War II infantry were more comfortable with an internal sweatband liner that rested lightly on the soldier's head. Serving multiple functions for the troops, helmets were used as washbasins, eating bowls, and cooking pans. Throughout the twentieth century, at military funerals, a soldier's helmet often sits atop a rifle symbolizing personal heroism and patriotism. From 1970 to 1997, the U.S. Army Natick Research, Development, and Engineering Center in Massachusetts developed the standard Personnel Armor System Ground Troops (PASGT) helmet; its shell is a one-piece composite molded structure made of multiple levels of Kevlar aramid fiber. Inside is a cradle-type suspension providing space between the helmet and head for ventilation and deformation during impact. Cotton and nylon twill camouflage reversible covers reflect different environments: woodlands, snow, and daylight desert. Continuing innovation, the twenty-first-century U.S. Army incorporates the most advanced high-tech features in its standard bulletproof Integrated Helmet Assembly Subsystem (IHAS). Its attachments, including night-vision goggles, allow for viewing the battlefield via digitized maps, messages, and sensor imagery generated from a personal computer and weapon sights, while receiving audio communications through a computer/radio subsystem composed of components embedded into the ballistic helmet shell. Defensively, the headgear also includes a chemical/biological protection mask and ballistic/laser eye protection. With nineteenth-century urban growth, larger police and fire units wearing military-style uniforms and helmets including chin straps, badges, and spikes encouraged esprit de corps. 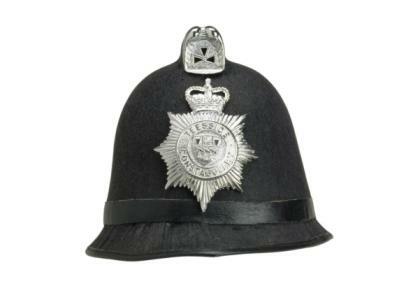 In 1863, London's Metropolitan Police began wearing the high-crowned dark serge-covered cork helmet (called "bobby hat" after the Tory prime minister Robert Peel, founder of the Metropolitan Police), similar to the lightweight pith helmet. Around 1900, a more practical, modern peaked hat was adopted in many countries, complemented decades later by titanium or plastic helmets with transparent anti-riot shields. Despite the changes, the English bobby hat survived. Parisian fire brigades in the 1830s were outfitted with metal, gendarmerie cavalry visor casques. Wide-brimmed leather fire helmets, which (unlike metal) resisted retaining heat, were first used in New York (1740s) and spread to many areas over the next century. By 1959, U.S. government safety regulations began requiring the use of polycarbonate-plastic helmets that are impact, penetration, and water resistant, insulated against electrical charges, and self-extinguishing. Fire helmets of 2004 have transparent plastic face masks. Coal and ore mining, which grew exponentially during the nineteenth century, gave little attention to head protection for workers. Leather or cloth caps had dangerous oil wick lamps attached for lighting. They were replaced by tin and fiber-compound helmets with carbide lamp attachments, which sometimes still caused explosions. The safest contemporary helmets have battery-powered electric lamps. The U.S. Department of Labor's Occupational Safety and Health Administration (OSHA) establishes regulations for industrial workers' hard hats, which come in varying types for use in construction, welding, electrical work, and mining, with appropriate accessories. Protective helmets for sports were largely introduced in the twentieth-century Western world. Earlier, horseracing jockeys, polo players, and fencers wore head protectors. Advertisements for English bicycle manufacturers in the 1880s show cyclers wearing dark pith helmets. By 1915, bicycle racers wore heavy, round leather helmets, similar to those of aviators and American football players, although recreational cyclists went bareheaded. After World War II, the "hairnet" made of leather strips attached to a round base became popular for racers; its style was later incorporated into Styrofoam and plastic headgear providing increased comfort and protection. Also in the 1990s, participants in other individual sports, such as motorcycling, skateboarding, and snow-boarding, began adopting helmets. Ski helmet use proliferated in 1998 after the accidental deaths of the celebrities Sonny Bono and Michael Kennedy. Design and durability for recreation sport helmets is usually classified by motorized and nonmotorized sports, including specifications for adults, children, and toddlers. Car racing helmets have neck braces, like those designed for pilots. Rollerblading helmets have ear covers but an open aerodynamic design for air circulation. Helmets for the more dangerous sport of skateboarding incorporate additional padding and snug fit, and bicycle helmets vary according to use-road racing, mountain biking, or touring. Many ski helmets incorporate a plastic shell over an inner Styrofoam liner with venting system for thermal protection. A few are made from lighter carbon or platinum materials. In the early 2000s ski racer, hockey, and football helmets have large extending chin protectors. Accessories include headphones or built-in speakers for radio communication, CDs, tapes, MP3 or mini disc listening, and cameras. 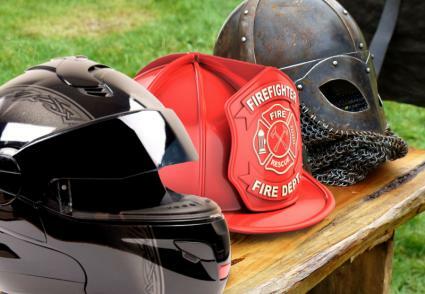 Appealing to youth, helmet manufacturers produce a wide range of helmet colors and novelty decals. The most complex helmets ever created are for National Air and Space Administration (NASA) astronauts. They protect the wearer in alien environments against extreme temperatures (250° F to 250° below zero); micrometeoroids traveling up to 64,000 miles per hour; solar ultra-violet, infrared, and light radiation from the sun; and zero gravity conditions. 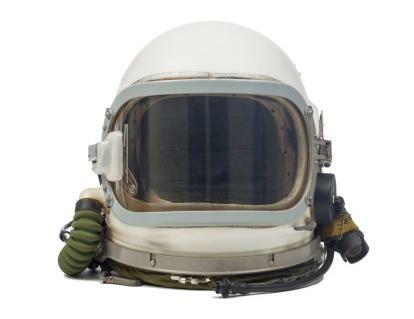 The pressure helmet consists of a transparent polycarbonate (plastic) shell with aluminum neck ring that fits into and locks with the space suit neck ring. The helmet left side contains a feed port where water and food enter, and a purge valve. A vent port of synthetic elastomer foam is bonded in back with a ventilation opening. The helmet functions as an integral part of the astronaut's life-support system. Oxygen, warmed to avoid fogging the visor, enters the helmet rear and travels over the head downward to the front. Carbon dioxide exits, via a fan and tubing, along with respiration- and perspiration-caused humidity. These are also integrated with the Feed-water and Liquid Transport Systems, which cool the astronaut, and radio transmitter/receivers. Recent "micro display" technology provides a visual image inside the helmet allowing technical diagrams to be beamed the astronaut. See also Men's Hats; Women's Hats; Headdress; Military Style; Protective Clothing. Alderson, Frederick. Bicycling, a History. New York: Praeger Publishers, 1992. Howell, Edgar M. United States Army Headgear to 1854. Vol. I (1969); United States Army Headgear 1855-1902. Vol. II (1976). Washington, D.C.: Smithsonian Institution Press. Nickel, Helmut, Stuart W. Pyhrr, and Leonid Tarassuk. The Art of Chivalry, European Arms and Armor from the Metropolitan Museum of Art. New York: American Federation of Arts, 1982. Reynosa, Mark A. The Personnel Armor System Ground Troops (PASGT) Helmet. Atglen, Pa.: Schiffer Publishing Ltd., 1999.